Ray Anderson born October 16, 1952 in Chicago, Illinois is an independent jazz trombone and trumpet player. Anderson is a boisterous trombonist who is masterful at multiphonics. Trained by the Chicago Symphony trombonists, he is regarded as pushing the limits of the instrument. He is a contemporary and colleague of trombonist/composer George Lewis. Anderson also plays Sousaphone and sings. He was consistently chosen as DownBeat Magazine’s Critics Poll best trombonist throughout the late 1980s and early 1990s. Ray was invited to be a part of the University of Illinois’s summer jazz workshop following his senior year of high school, and then he spent some time attending Macalester College in Minnesota. After one year at Macalester, Ray moved on to the California Institute of the Arts where he studied with jazz musicians such as as Keshavan Maslak, Charles Moffett, and Stanley Crouch. 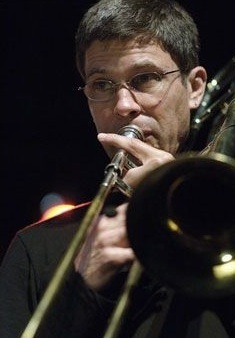 After three years in California, Ray moved to New York City in 1972 where he played in the Tommy Dorsey band, the funk band Hidden Strength, and then Maslak’s Surrealistic Ensemble. The turning point in Ray’s career came, however, when he was called to replace George Lewis in the Anthony Braxton quartet. This gig launched him into the spotlight and landed him several special appearances at such prestigious events as the 1979 Moers Festival with the Roscoe Mitchell-Leo Smith orchestra. Ray Anderson formed the Slickaphonics with Mark Helias and toured Europe as a leader in 1980. Down Beat magazine’s critic’s poll named Ray the premier trombonist deserving of wider recognition in 1981, and also provided Harrisburg Half Life, Ray’s very first album as a leader, with four stars. He continued to impress both critics and fans alike for many years. In fact, praise was given for his Connoisseur album, the What Because album, and even his 1991 Wishbone album. Ray has appeared on many other renowned musicians’ albums as well, including David Murray, Charlie Haden’s Liberation Music Orchestra, the George Gruntz Concert Jazz Band, Dr. John, Luther Allison, Roscoe Mitchell, the New York Composers Orchestra, Bennie Wallace, and others. Since 2001, Ray Anderson has been teaching at State University of New York at Stony Brook. In 2003, he was asked to be the Director of Jazz Studies and has been ever since. Ray has also been awarded grants for his interest in music composition from the National Endowment for the Arts, the Fund for U.S. Artists at International Festivals, and the Chamber of Music America.